Since starting my Poetry Corner in May 2011, with the exception of one poet from Chicago, I have featured only American poets I have met here in Los Angeles. Some of them have become close friends. This year, I will explore the poetry of diverse poets across the United States. 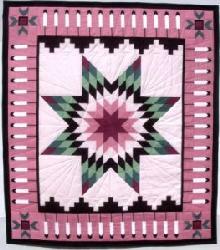 In my Poetry Corner this month, I feature the poem “Making Quiltwork” by Simon J. Ortiz, a Native American poet. Born in 1941 near Albuquerque, New Mexico, Simon Ortiz is an Acoma Pueblo Indian who grew up in an Acoma village speaking his native language. In an interview, he said that in sixth grade (11-12 years of age) the library opened a new world to him. In 1969, after attending Fort Lewis College and the University of New Mexico, he earned a Master of Fine Arts in Writing from the University of Iowa. Scholars of Native American literature consider Simon Ortiz one of the most accomplished writers of the Native American Renaissance of the 1960s and 1970s. His 1982 poetry collection, From Sand Creek, won a Pushcart Prize, bringing him to national attention. Eleven years later, based on his body of work, the Returning the Gift Festival 1993 of indigenous writers recognized Ortiz with a Lifetime Achievement Award for literature. Simon Ortiz sees himself more as a “storyteller” than a “poet.” In his poetry, essays, and short fiction, he shares stories of his peoples’ struggles and joys of everyday life. He doesn’t shy away from raising thorny issues of their historic encounters with the early colonialists and loss of their ancestral lands. into odds and bits, determined to remake whole cloth. Their triumph over adversity and continuance as a people are woven into their quilts. Perhaps this is the reason why this poem resonated with me. Read the complete poem, “Making Quiltwork,” and learn more about Simon Ortiz’s life and work at my Poetry Corner February 2014.